We’re back in the swing of things, and happy with how great the projects we made this week came out. Not only us, but here are a few more testimonials we received last week. And now onto needlepoint kits. 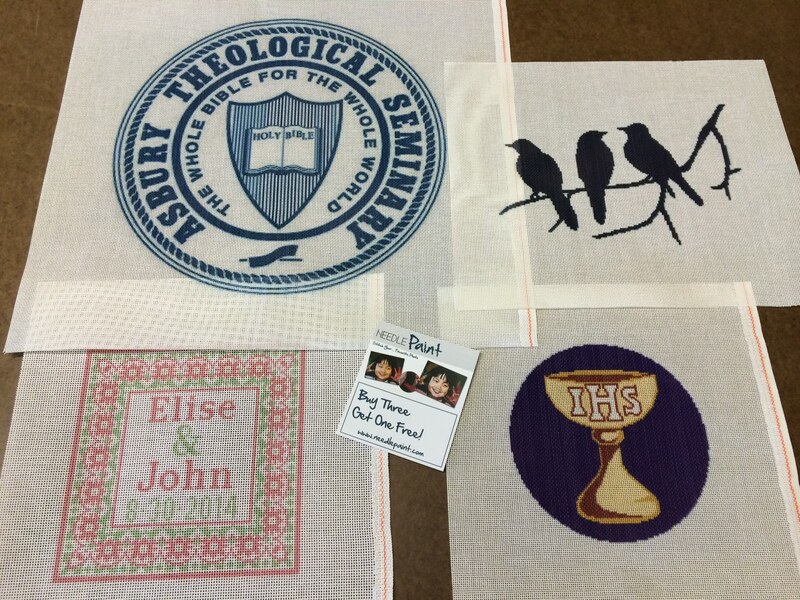 Below are some of the wonderful projects we made this week that I can’t wait to see once they are finished! This design started as a compilation but as I got closer I realized we needed to make a dedicated freshwater gamefish belt! Designed for the guys who head out at the crack of dawn in the summer looking for big one, this belt features some of the most popular fish found in midwest and east coast of the United States. They are a: largemouth bass, bluegill, walleye, northern pike, stripped bass (freshwater), sunfish, perch, and smallmouth bass. 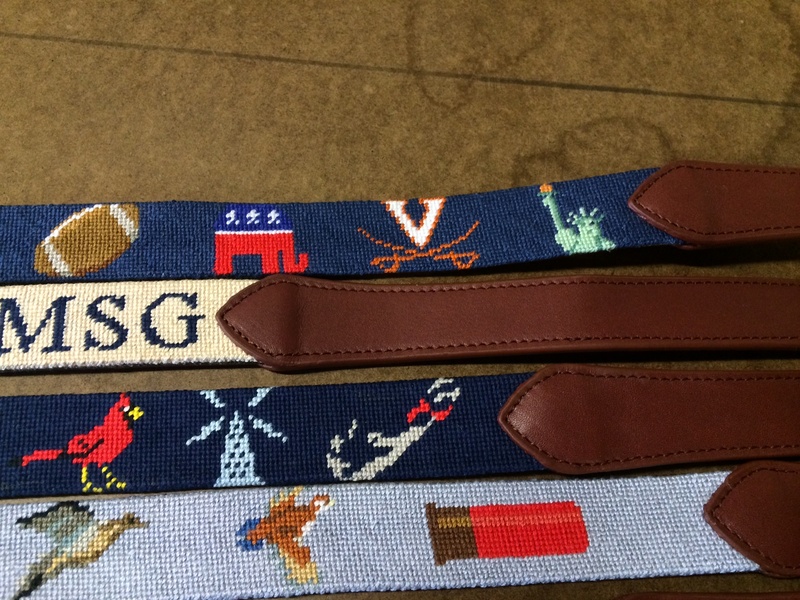 If there is a fish missing that you’d rather see on your needlepoint belt, let us know! 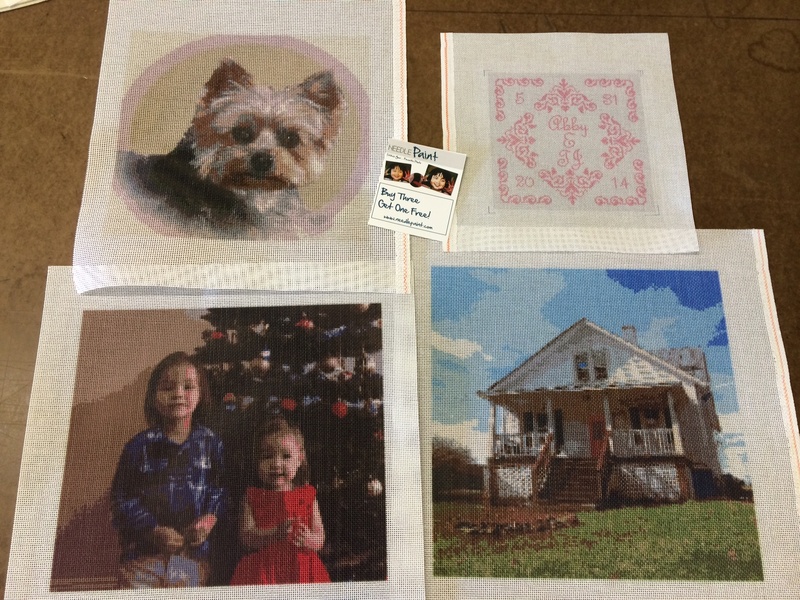 If you’ve ever wanted to make a needlepoint canvas from a photo, below are some inspiring new projects! 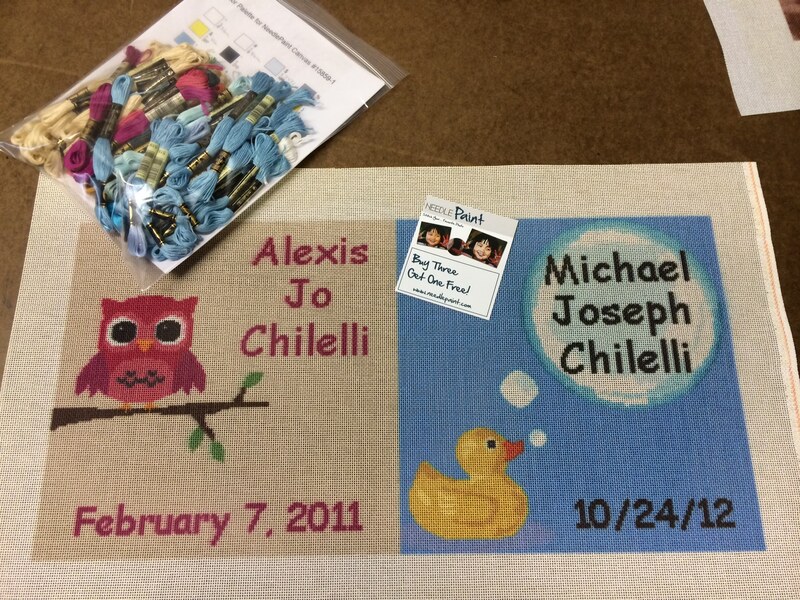 Also, more personalized needlepoint belt canvases feature some great life details. A final note, we will be away next week, so emails and calls will not be answered until March 24th. Orders will be shipping on March 28th. If you have any questions between now and then, feel free to write or call and leave a message, we will get back to you. 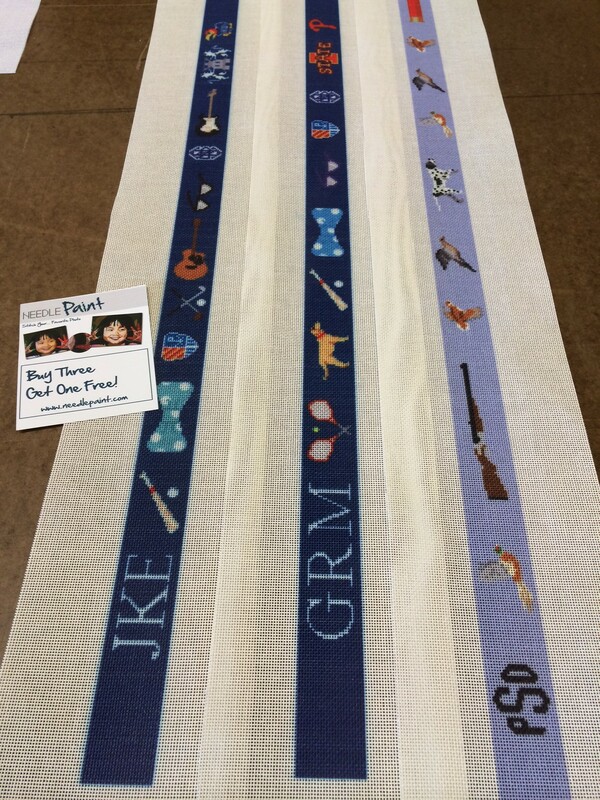 It is not everyday that we find true talent, but about a week a go I was contacted by a very talented artist who is interested in creating custom needlepoint belt designs for us. I’m amazed by their ability to capture details on a belt that normally would not be possible using only 22 stitches. 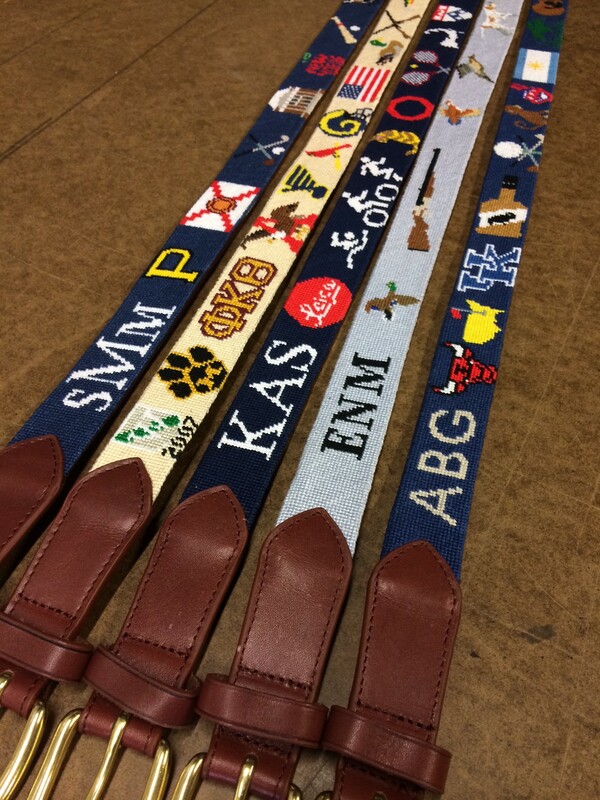 The custom college needlepoint belt design is just an example of what we can do. The preview below is of the Notre Dame campus in South Bend, Indiana, but you go ahead and tell us the campus you’d like on your belt along with buildings, stadiums, and landmarks and we’ll create a new design for you! 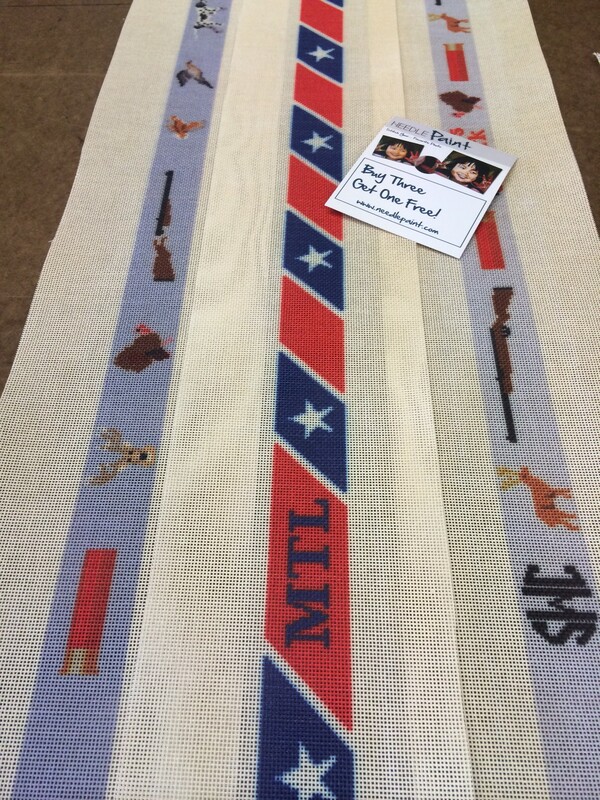 Keep in mind our designs can be ordered either as a needlepoint belt or you can order the needlepoint canvas and stitch it yourself! 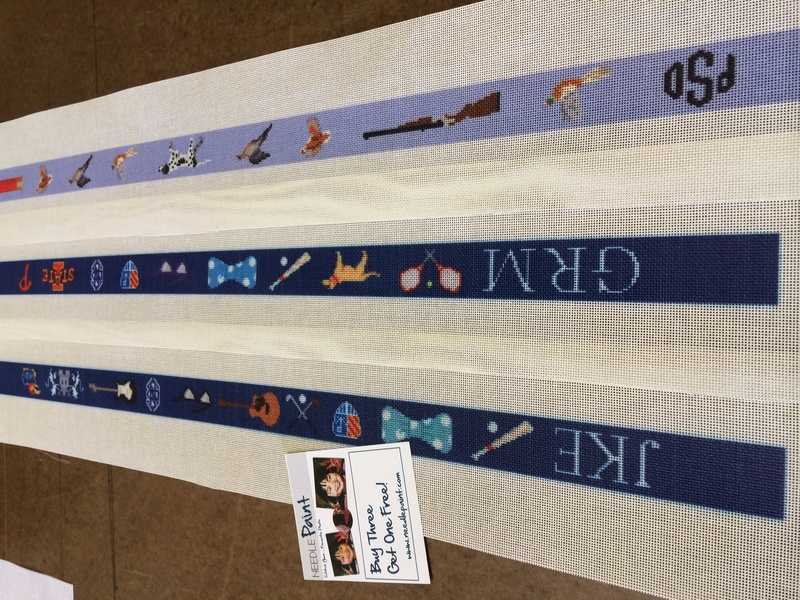 Another example we created is the custom landscape scene needlepoint belt canvas. You may have seen a picture of this canvas in last week’s Friday Favorites blog post. This is just an idea, but how cool would a city scape of New York, Chicago, or Paris be! 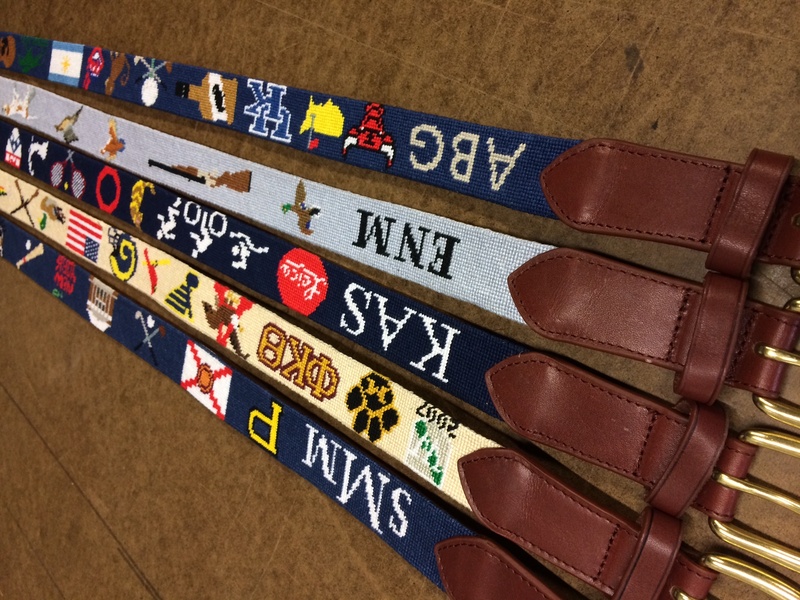 If you’re looking for a simpler design (and cheaper), our Life Treasures Custom Needlepoint Belts are most likely the best bet. Simple but elegant, we take the favorite things from your life an put it into stitches. Think teams, schools, sports, and hobbies, these make excellent gifts! This week I’m going to start out with some feedback testimonials we got this week, it is fun designing and making projects and getting such good feedback! Ahh, but you’re not reading this blog to hear you’re here to get inspired! Below are some of my favorite designs from this week, the descriptions are below the pictures. The DMC rainbow appeared again on our work table! 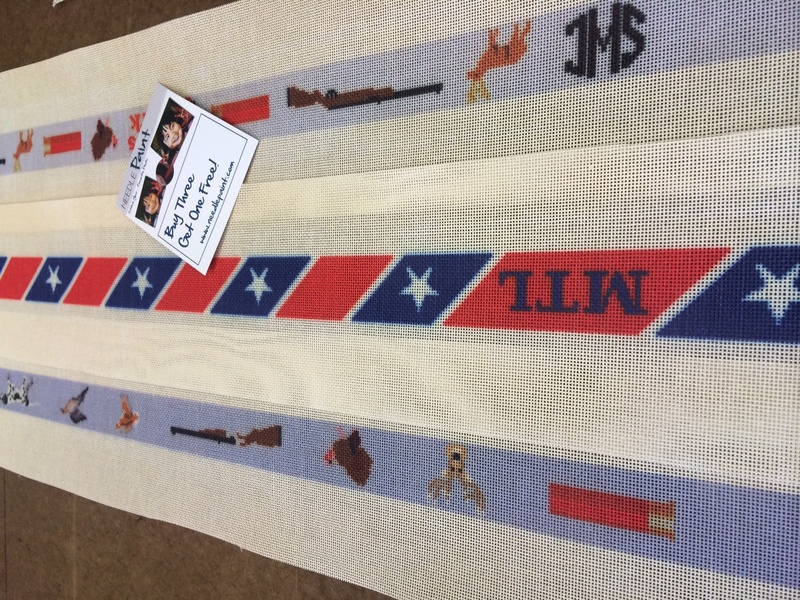 We get a fair amount of orders from people who are purchasing custom needlepoint projects as gifts for other people (especially around Christmas). One of the most common questions we get is what is the “correct” mesh count to purchase and how “easy” is the design. To start out, there is no “correct” mesh count as different stitchers prefer different counts. For a newbie learning about needlepoint, the mesh count stands for the number of stitches in one linear inch. That means you measure 1 inch along a line on the canvas, and count the number holes. A 10 mesh count means there are 10 holes per inch. 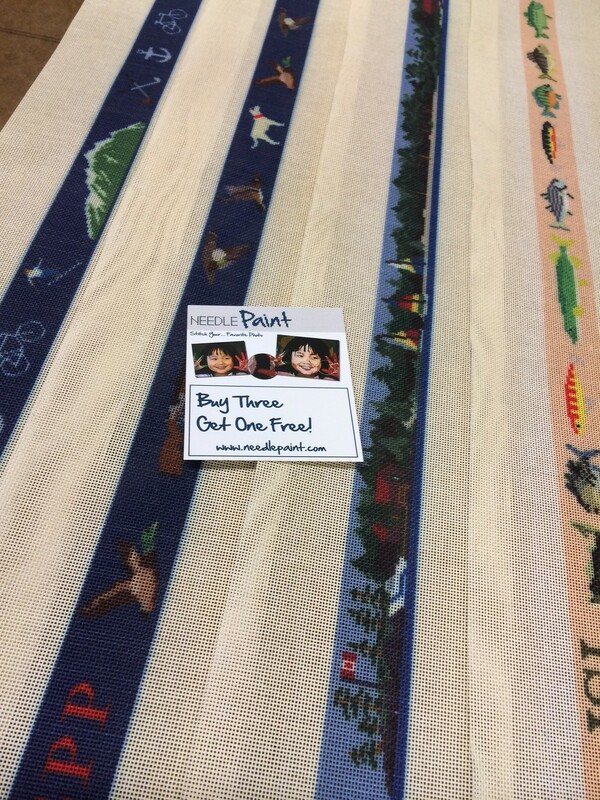 A 18 mesh count canvas means that there are 18 holes per inch. This may not sound like a lot, but to a stitcher it is a HUGE difference. If you consider that 10 mesh count canvas has 100 stitches in a square inch and 18 mesh count has 324 stitches per sq. in. 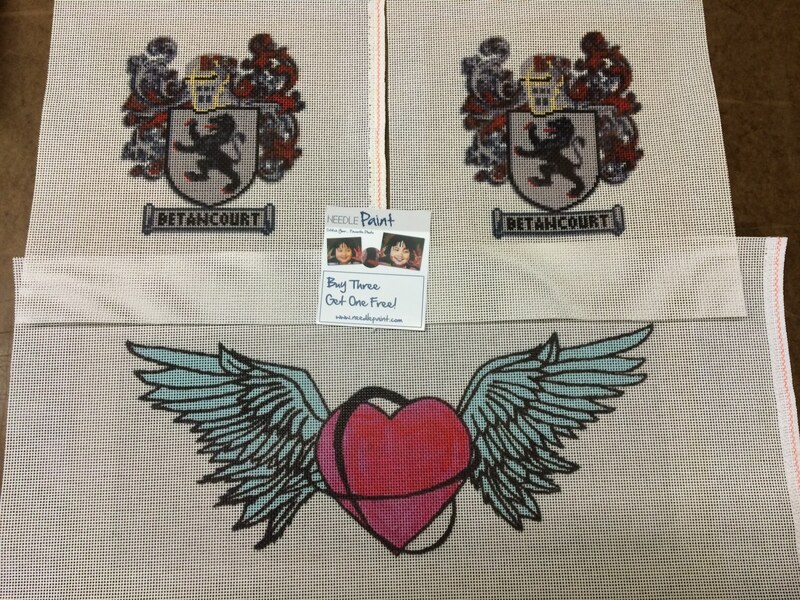 that means that the stitcher has a LOT more stitching to do if you order 18 mesh count canvas. Thus, I suggest not ordering 18 count canvas on any design that is wider or taller than 12 inches. For smaller canvases it is OK to use 18 mesh count because it allows the design to show a lot more detail. Some stitchers do prefer more detail at larger sizes, so this is just a guideline for reference. The stitchers eyesight. 18 count has more stitches per inch, so the holes are a lot smaller and harder to see. 10 mesh has the largest holes. If she has weakening eyesight, you may want to avoid 18 mesh count canvas. 14 or larger should be OK. Fiber preference. Needlepointers love to work with a lot of different fibers, the most common are wool, cotton, and silk. 13 and 14 mesh count canvas will work with almost any fiber and are the most commonly used canvas today. If the stitcher prefers wool, you may want to use a canvas with 14, 12, or 10 mesh count. 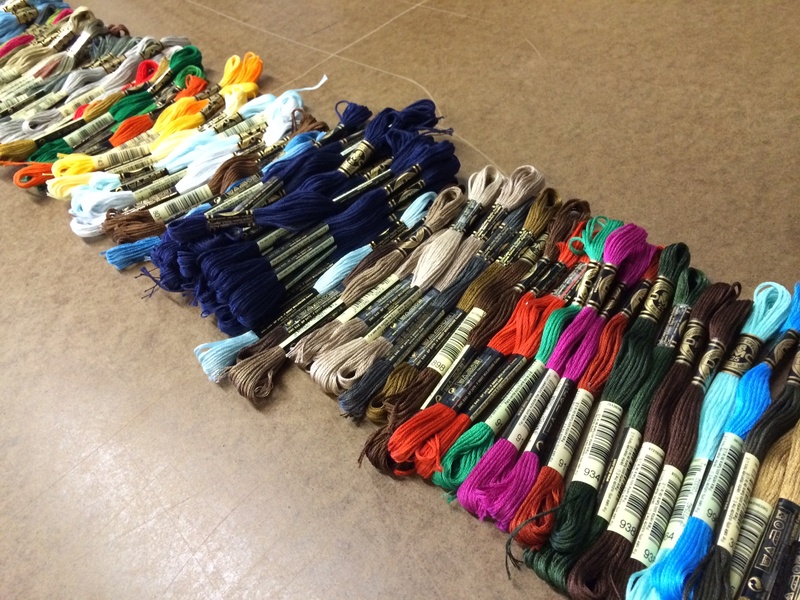 With 18 count canvas we only supply cotton, but there are other fibers that will work, just not as many. The design details. Higher mesh counts (18 and 14) will show more detail than the larger mesh counts (12 and 10). Belt canvases often come on 18 mesh count canvas because you need the extra stitches to show designs on an area that is so limited in height. If your design is very detailed or you want to fit a lot into a smaller area, you will want to use 18 mesh count. But, if you try the 14 mesh count option on the website and still think it looks good, you can use that too. The design size. If you find that you need more detail but have to use larger holes, you can always increase the overall size of the design, this an alternative way to increase the detail, but does add to the cost of the project. Typically I think the sweet spot for design size is around 12 x 8 inches. To see how to adjust the mesh count and height, watch our how to design a pillow instructional video. 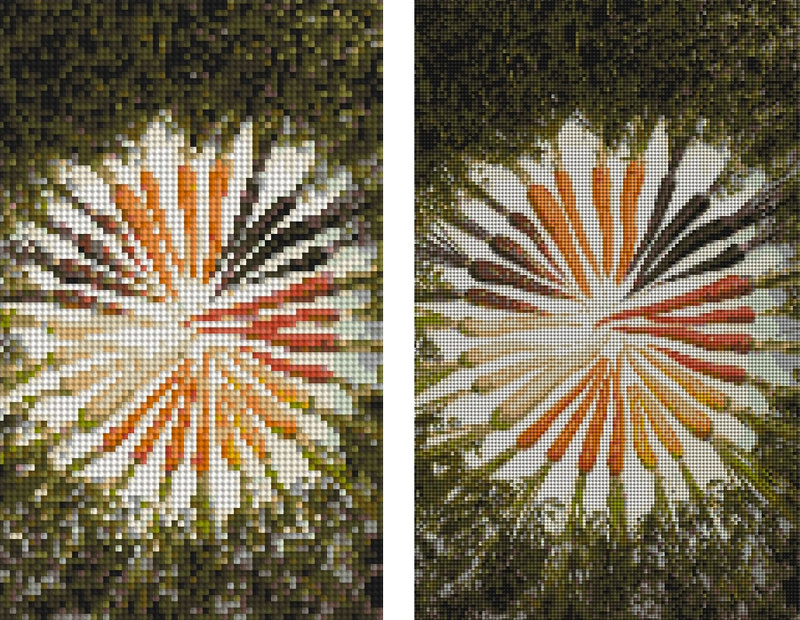 Carrots of Many Colors 10 mesh count vs 18 mesh count canvas. The 18 mesh is on the right and shows a lot more detail. Next we have the “easy” question, or degree of difficulty. This is very subjective, but there are some obvious guidelines that can help you determine how difficult a project will be to stitch. The number of colors. Often, the more colors there are on a canvas the trickier it will be to stitch. 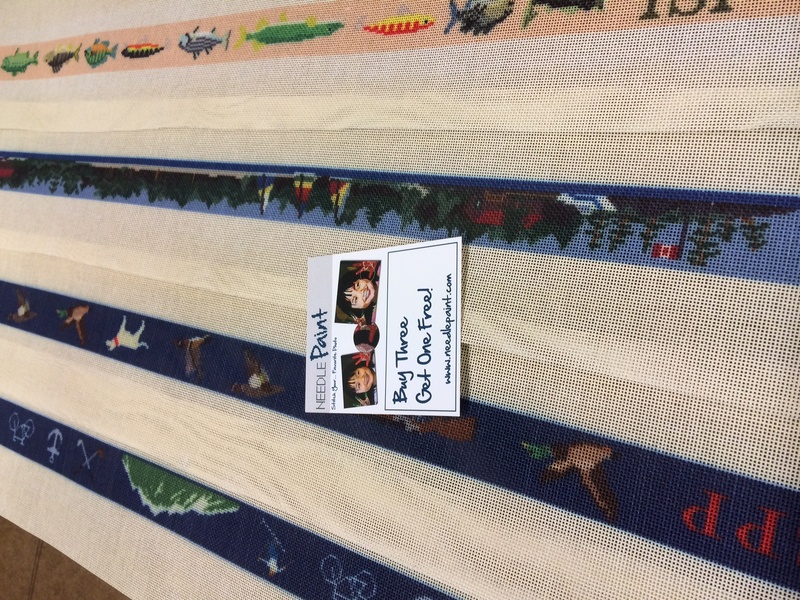 This is especially true with photo needlepoint canvas designs. The shadowing and gradients get harder to see the more colors there are. Also the thread colors get very close, so even they get hard to tell apart. When stitched this looks amazing, but a beginner stitcher may find this very tedious. Typically I recommend keeping the number of colors below 20 if possible. If you are using the website and want help, feel free to email us, we’d be happy to help! The nature of the design. 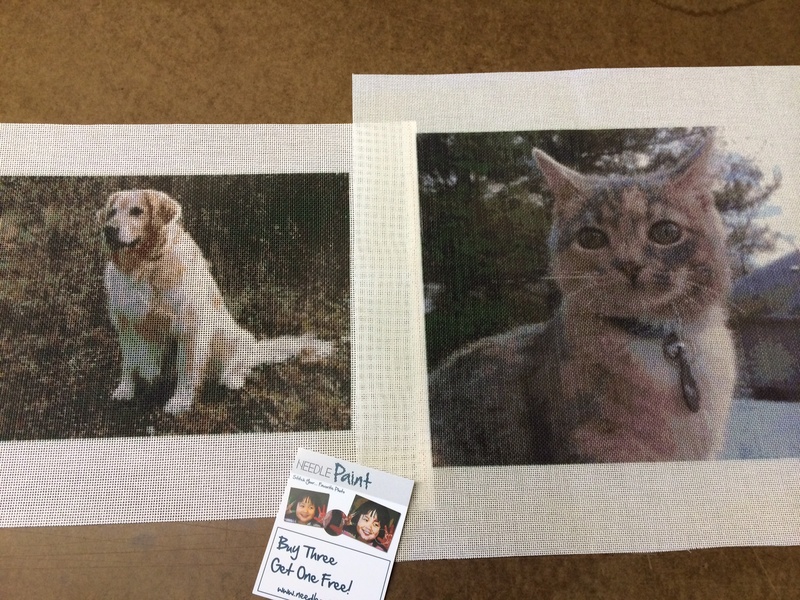 If you are using a photo there is often a lot of intricacy in the placement of the stitches. Easier canvases will group the colors together in larger blocks, so the stitcher does not need to change thread every third stitch. Designs and artwork with plain colors and patterns often are the easiest to stitch as the contrast between the colors is big and the patterns are simple to follow. 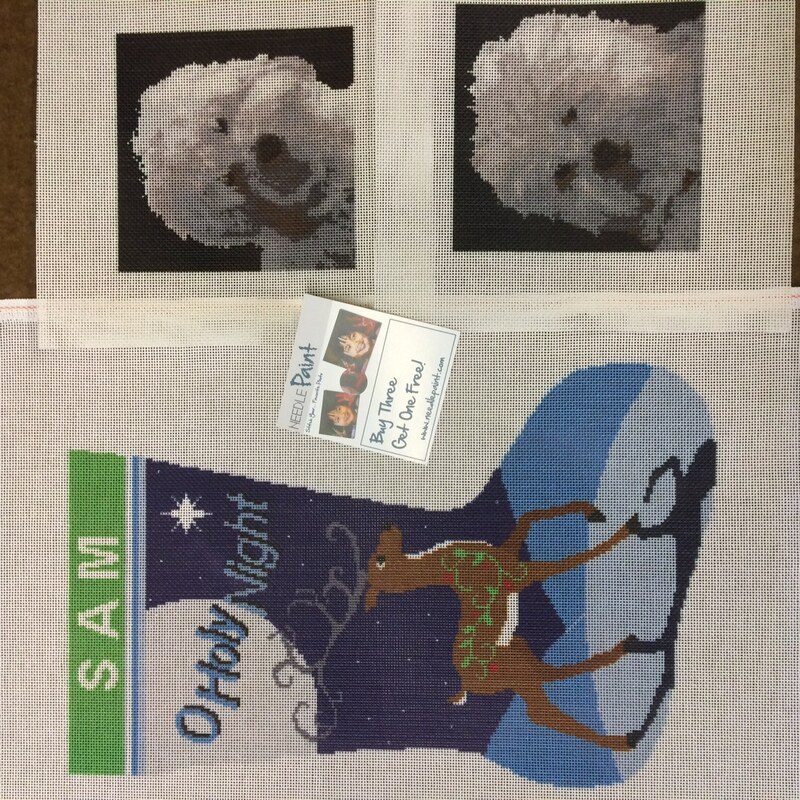 The dog needlepoint designs we have on our website range from moderate to difficult, the new stitcher can do a moderate design, but it will take them a while. 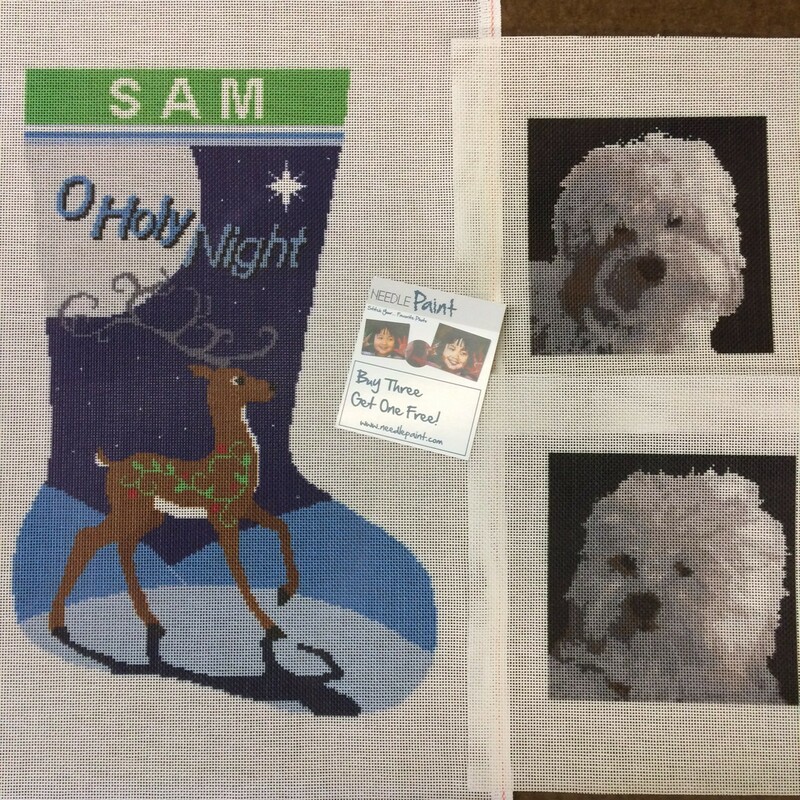 The original artist needlepoint designs we have licensed are easy to moderate, mostly they go in the easy category. And our baby and kids designs all are also in the easy realm. 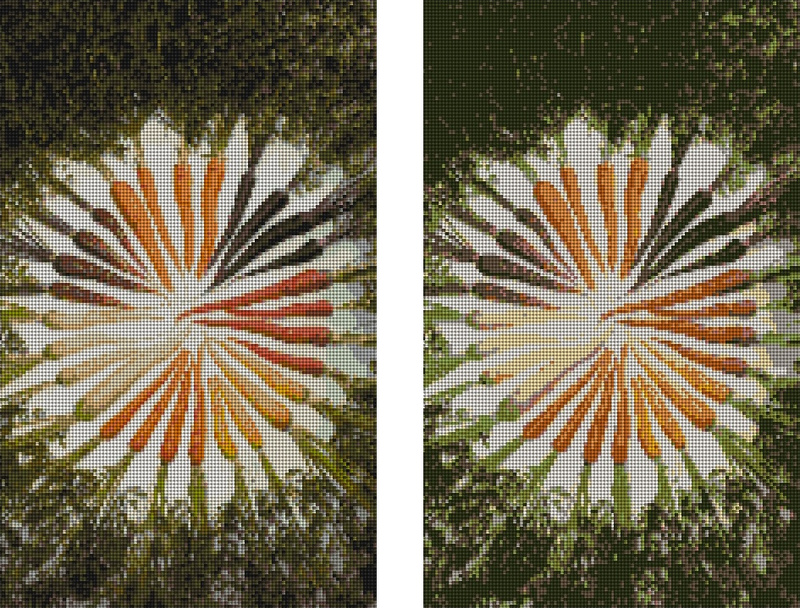 Carrots of Many Colors 25 colors on left vs 11 colors on right. Notice the white carrots loose detail. 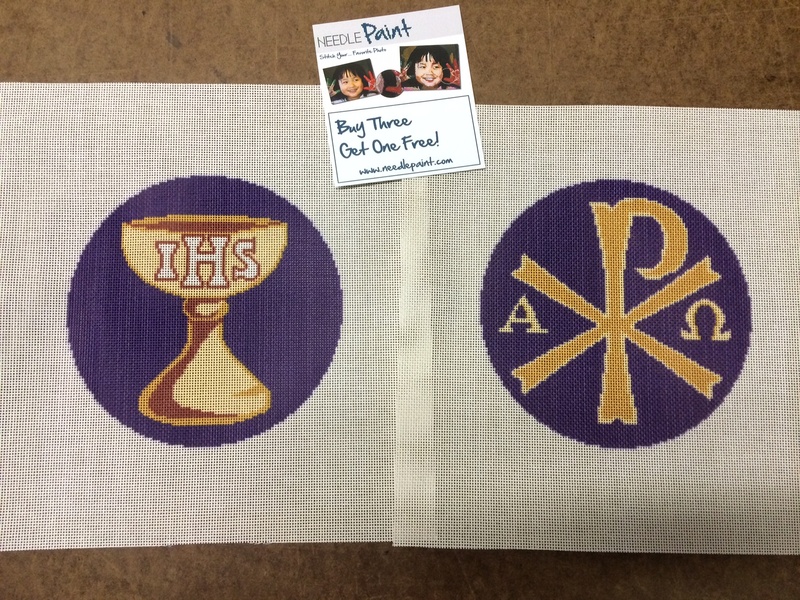 Not a very big difference to the eye, but to the stitcher 25 colors would be significantly harder. If you decide to reduce the number of colors, but notice something that you would like adjusted, go ahead and place your order and email us the image you used, we can touch up the design for you!